10 Best Design recently updated its monthly rankings for companies that qualify for the Best eCommerce Web Design Firm awards. The list for May 2016 included companies like Big Drop Inc., Blue Fountain Media, and Dotcomweavers. 10 Best Design recently released its rankings for the top eCommerce web design businesses. The reigning contender for May 2016 was Big Drop Inc., which is based in New York. Headquartered in California, 10 Best Design has recently published an updated list of agencies that qualify for the Best eCommerce Web Design Firm. The rankings have been compiled according to a complex rubric system that takes into account each company's e-commerce abilities. The judges at 10 Best Design have a lot of experience in rating Web design firms that specialize specifically in launching online stores. Big Drop Inc., the top eCommerce Web design firm, has its main operational headquarters in the heart of Manhattan. This Web design agency builds online shops for retailers and merchants in New York City. Most of the e-commerce solutions that are offered by Big Drop Inc are somehow affiliated with open source technology that is readily available for Web developers. For instance, Big Drop Inc has a lot of confidence in the power of Magento Hosting for supporting online stores. Merchants can use such a content management system to update their inventory and do a whole lot more through a simple module. Big Drop Inc also considers itself a specialist in importing third-party e-commerce tools in order to facilitate the operational components of online stores. 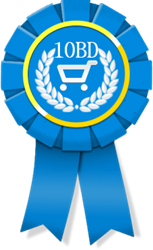 Named second-best in the category of best e-Commerce Web design firms is Blue Fountain Media. Also based in New York City, it builds online stores for clients in the Big Apple. In addition to setting up shopping carts, this agency goes as far as finding compatible freight carriers such as DHL, UPS and FedEX. The programmers at Blue Fountain Media take the time to optimize the front end of a given online shop by using a combination of dynamic scripts like PHP and Ruby on Rails. Dotcomweavers proudly claims the third spot on the list of leading eCommerce Web development firms. This N.J.-based company likes to mix and match e-commerce technology such as Shopify, Marketo and Magento Hosting. The developers at Dotcomweavers spend a lot of time on finding the right payment processing partners for managed merchants and retailers. It's important for an online shop to be powered by the latest cyber security that can provide peace of mind for all parties involved in online transactions. SSL certificates and cloud hosting are often used by this firm for e-commerce security.